Hop onboard one of the restored, colorful F Line streetcar for a relaxing sightseeing ride. Symbolic of the charm and distinct flavor of the city of San Francisco, these vintage electric streetcars from the early to mid-20th century, (sometimes called trolleys or trams) are a sight to see and ride on. Enjoy the ride from the Castro District to Fisherman's Wharf with stops every few blocks on Market Street and The Embarcadero. Tip: Always ask for a transfer when you board, in case you need to hop off and hop back on along the way. Transfers are good for 90 minutes. San Francisco's Municipal Railway has assembled one of the most diverse collections of vintage streetcars you can find anywhere in the world. The collection includes cars from Philadelphia, St. Louis, New Orleans, England, Belgium, Portugal, Japan, Germany, Russia and Melbourne, Australia. The fleet of antique streetcars from around the world run primarily on The embarcadero between Fisherman's Wharf and the Ferry Building. A single ride fare on Muni is good for 90 minutes of travel, whether it be on a single route or a trip with multiple transfers across buses and light rail. You can save $0.25 per trip by paying with a Clipper® card or MuniMobile. Eligible Youth and Seniors must apply for and receive a Clipper card before they can purchase the discount monthly pass. Popular Question: What is the difference is between a San Francisco Streetcar and a Cable Car. Answer: Streetcars in San Francisco has a trolley pole that connects them to an overhead wire. Cable Cars on the other hand run on steel rails with a slot between the tracks with no overhead wire. 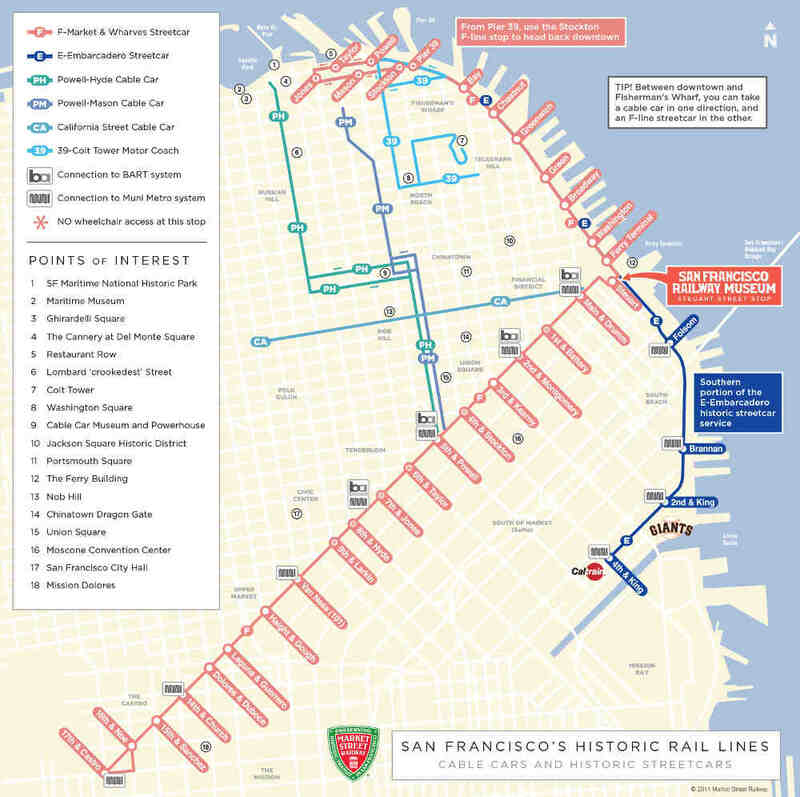 A single ride fare on San Francisco's historic streetcars is good for 90 minutes of travel. This allows you can hop on and off anywhere during the 90-minute validity period of the transfer. Transfers are issued only when boarding and may be used on Muni Metro and bus lines. Transfers may not be used on cable cars.